Collingwood have eked out a scratchy 14-point win over Western Bulldogs, lifting late on the back of Brodie Grundy’s ruck heroics to improve their record to 2-2. The Magpies lost milestone man Chris Mayne in the opening minutes of Friday night’s clash at the MCG, while star midfield recruit Dayne Beams (migraine) was a late withdrawal. But after trailing by five points at three-quarter time, the Pies finished strongly to secure an 11.12 (78) to 9.10 (64) win after a scrappy and low-scoring first half. 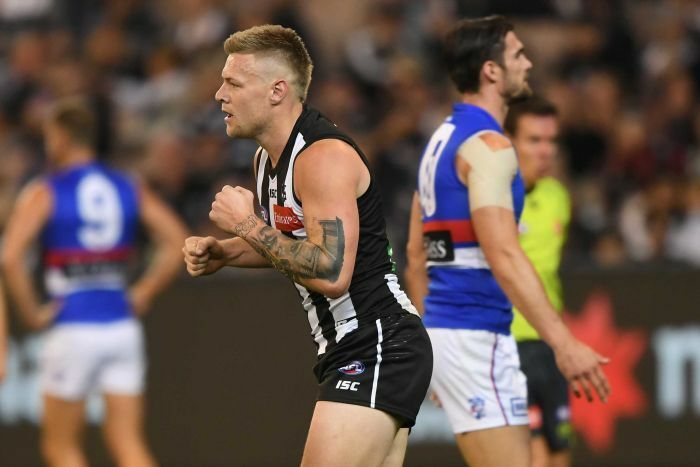 Ruck-forward Mason Cox’s strong mark and set shot handed the Pies a match-winning lead midway through the final term before late goals to Josh Thomas, Jaidyn Stephenson and Jamie Elliott put the result beyond doubt. Grundy monstered rookie opponent Tim English to win the hit-out count 58-6 and gather 23 disposals, while Travis Varcoe (20 disposals, one goal) was at his livewire best after being omitted last week. The Bulldogs were led brilliantly by Marcus Bontempelli (36 disposals, eight clearances) but couldn’t stay with the Pies when it mattered and failed to capitalise on their forward supply, racking up 27 inside-50s to halftime for just 2.7. Magpies veteran Mayne’s 200th game was over in minutes after he copped a heavy knock to the back and limped to the rooms for treatment. The two sides had an eye-watering 75 uncontested marks in the first quarter alone, many of which were the result of clanger kicks from the opposition. The game opened up in a lively third quarter ignited by young Bulldogs star Aaron Naughton outmarking Darcy Moore and slotting his first goal of the game. With the game finally played at a tempo more to their liking, the Bulldogs’ frenetic pressure gave them the ascendancy and put them ahead for the first time. But the Magpies benefited from a moment of magic late in the quarter from Varcoe, whose no-look handball on the boundary line set up a Stephenson goal. Coach Nathan Buckley had challenged his much-hyped midfield to improve after being comfortably outpointed by their West Coast counterparts last week. Adam Treloar, Scott Pendlebury and Taylor Adams lacked influence during the first half but Moore and Jordan Roughead were influential down back.